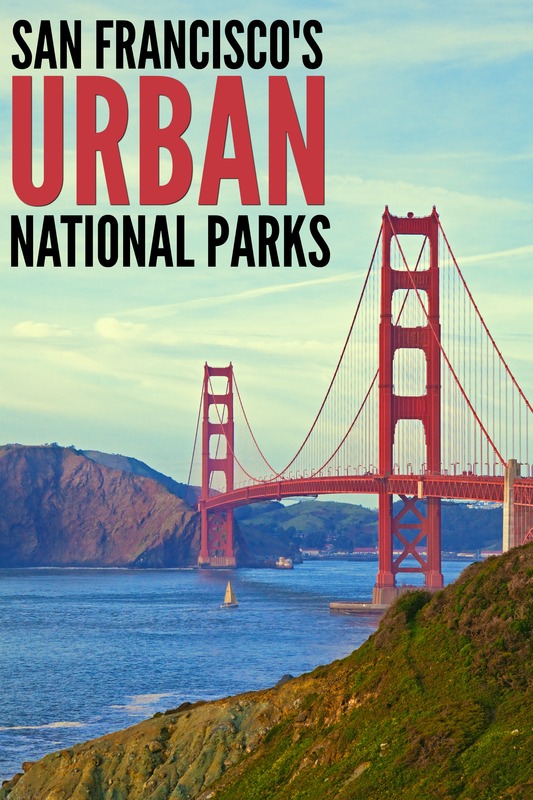 A guide to San Francisco’s Urban National Parks. Get off-the-beaten path, in the big city. When you think about visiting San Francisco, your first thought probably isn’t to check out a National Park. Most people think National Parks are vast areas, far from major cities, where you can escape and be one with nature. However, there actually are many exciting national parks in big cities around the country and San Francisco has some of the best! 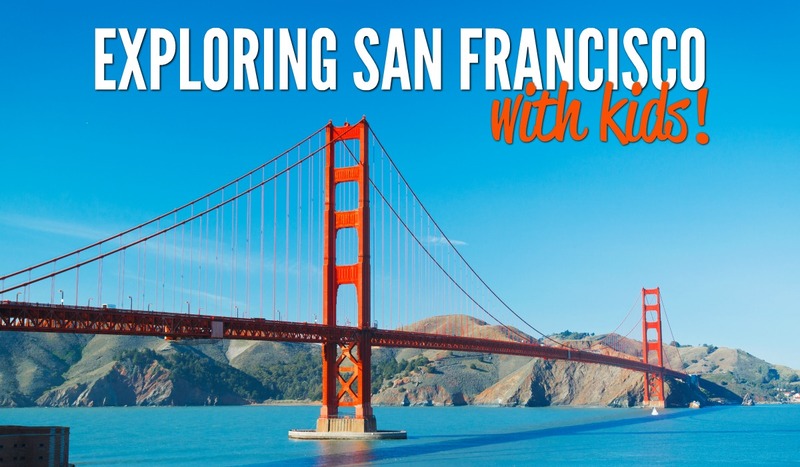 We recently visited San Francisco and set out to explore the city’s urban national parks. I have been to San Francisco a number of times and have seen nearly all of the top tourist destinations. My husband visited once before and has seen some top spots but was eager to explore some new things. The kids had never been and were up for anything. 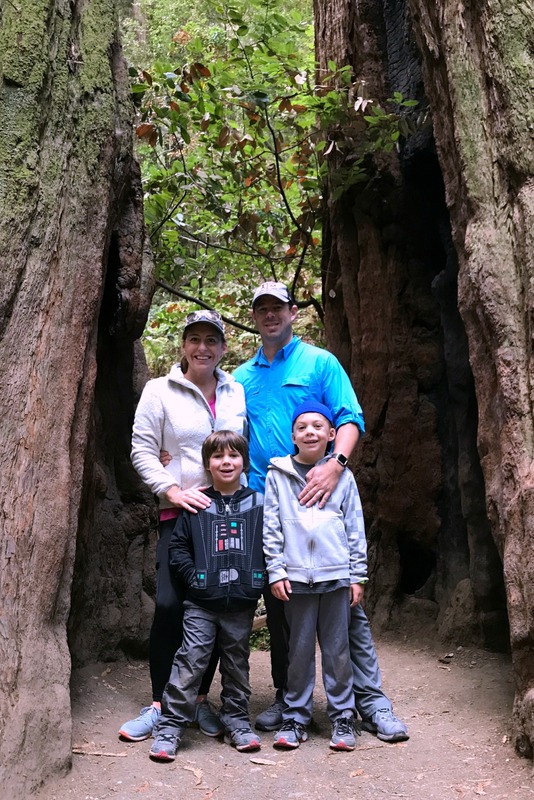 So we thought a trip through San Francisco’s urban national parks would be a great way for me to check out some new things while still allowing my husband and kids to see much of the city. 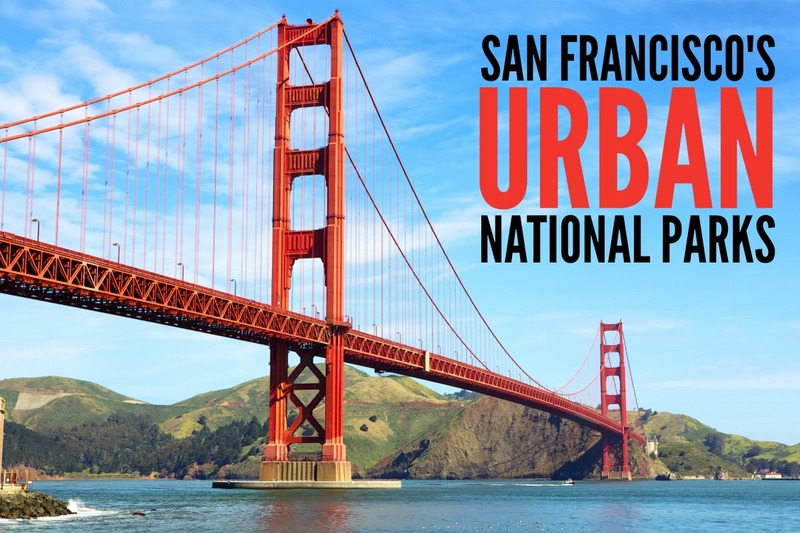 Another reason we chose to visit San Francisco’s Urban National Parks is because national parks are usually free or very inexpensive. This means visiting them would be a great way for our family to explore an expensive city on a budget. The National Park Service also has a Junior Ranger program for kids. I’ll share about the activities available at each park, but this helps kids stay engaged and excited about their surroundings and they get a cool little pin at the end as a souvenir. The Muir Woods is a Redwood Forest about 45 minutes from the heart of San Francisco. Easily accessed by a combination of public transportation and a shuttle. It’s home to some of the tallest trees on Earth. Despite all of my trips to San Francisco, I had never been to the Muir Woods and I think this was my favorite of all our destinations. The park has more than a million visitors each year but you would never know as the park is quiet, peaceful and serene. 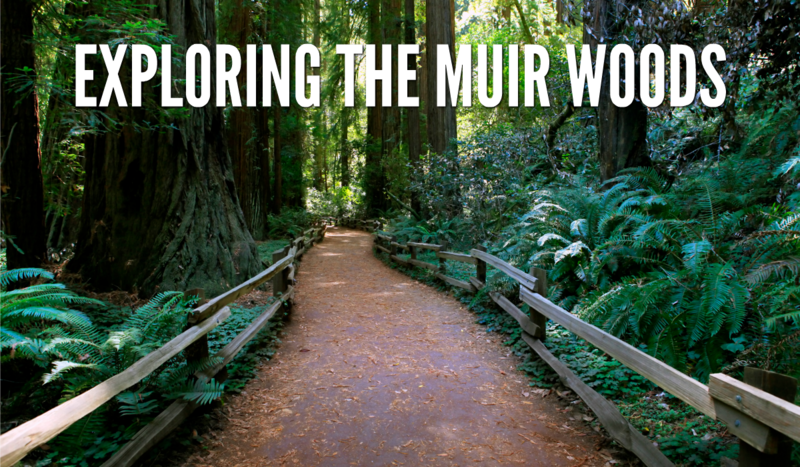 The Muir Woods contain 6 miles of trails. 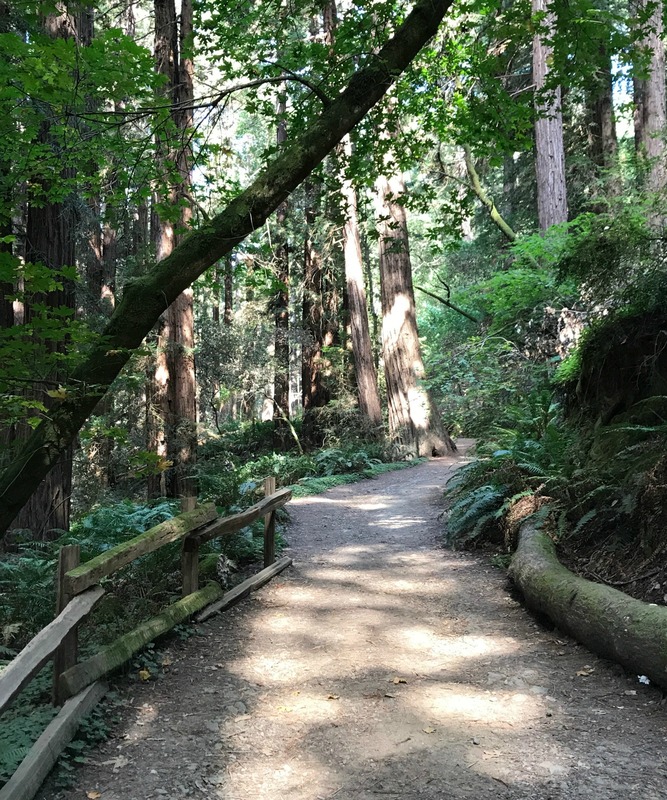 There is a 1/2 hour loop, a 1 hour loop, and a 1 1/2 hour loop, as well as longer hikes on trails that extend into the surrounding Mount Tamalpais State Park. The timed hikes mentioned above are boardwalked and asphalted which make them stroller and wheelchair friendly. We did the 1 1/2 hour loop and also ventured off the path with a short trail into the neighboring state park. While there are much more rigorous hikes along the canyon rim, this particular hike was easy and enjoyable for my 5 and 6 year old. The Muir Woods also has a junior ranger program. When you first enter the park, you can pick up a Junior Ranger booklet. It is full of information and activities to teach kids about the area around them. I actually learned more about the trees from the boys’ activity books than I did from the park plaques we passed. They learned how to see how old the trees and sprays were and how forest fires recycle nutrients. Show your completed book to a park ranger at the end of your visit and get a Muir Woods Junior Ranger Pin. These are great little souvenirs for kids. 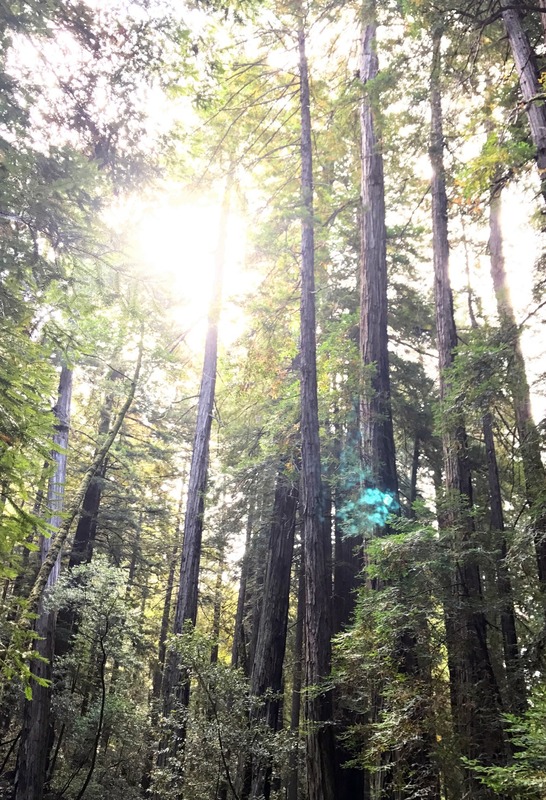 Read more about our visit to the Muir Woods: Exploring the Muir Woods. Know Before You Go: New for 2018, you’ll need to make a parking or shuttle reservation in advance. This helps with the very limited parking and helps control the volume of tourists coming to the park. These can be made up to 90 days in advance. If you are planning to visit during peak tourist times, reserve your spot early! Parking is $8, Shuttle rides are $3 per person. Park admission is $10 for adults 16 years and up. 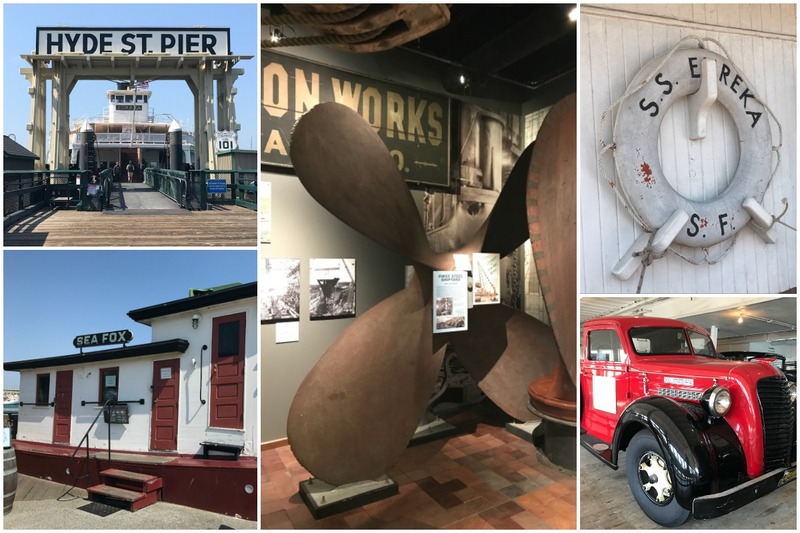 If you’ve ever visited San Francisco’s Fisherman’s Wharf, you’ve likely walked right past The San Francisco Maritime and not realized it was a National Historic Park! This particular park offers visitors a glimpse in Pacific Coast maritime history. There is a fleet of historic ships, a Visitor Center and a small Maritime Museum. I recommend you start at the visitor center. It’s on the corner of Jefferson and Hyde, very close to Ghirardelli Square. It’s easy to miss but definitely deserves a visit! We picked up the boys’ Junior Ranger booklets here and most of the questions cover exhibits in the visitor center. One exhibit recreates six historical waterfront neighborhoods. It was fascinating to see how the area has changed from the earliest, native inhabitants, through the Gold Rush and during war time. We also went out onto the pier to explore the fleet of historic ships. There are normally seven ships to explore but one was dry docked for restoration during our visit. The six we saw were all unique and fascinating. 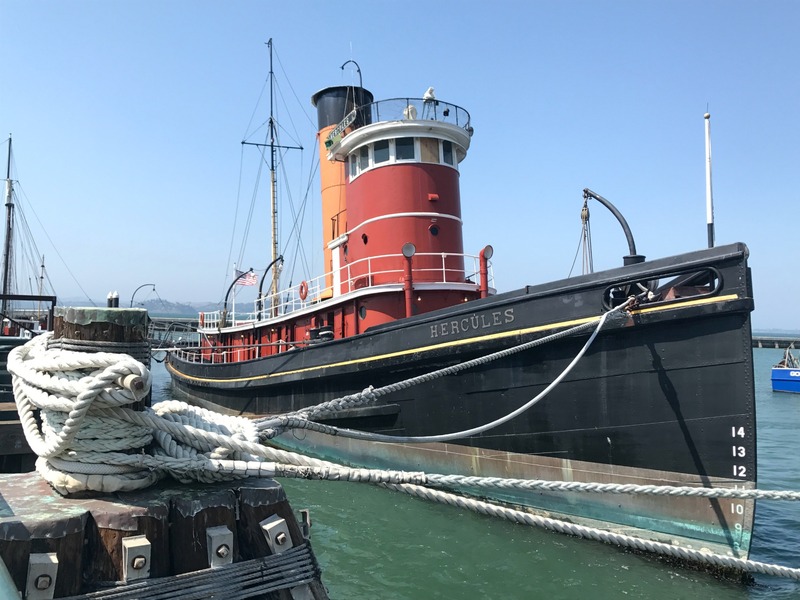 There’s a ferry boat, a tug boat, fishing boats….each tells a different story about San Francisco’s maritime history. We were able to go aboard many of them and explore. My boys really enjoyed this! Know Before You Go: If you choose to visit the actual ships, (you should!) be advised that it is very windy out on the pier. Even on a warm, sunny, August day we were chilly and grateful for our jackets. The Visitor Center and Maritime Museum are free. Entry passes to visit the historic ships are $10 for adults 16 years and up. There is also no parking for the Visitor Center so it’s best to use public transportation or walk. Located directly under the Golden Gate Bridge, Fort Point defended the San Francisco Bay following California’s Gold Rush through World War II. You can walk throughout the old fort and see some fascinating exhibits. One of my favorites was about the lighthouses that have stood at Fort Point. There was also a good exhibit about the Buffalo Soldiers and their fight for equality. Since Fort Point existed before the Golden Gate Bridge, they had a prime location to watch the construction. This particular spot doesn’t have a Junior Ranger program however, my kids still enjoyed our visit. They loved the narrow, stone spiral staircases and exploring all the hidden nooks and crannies. 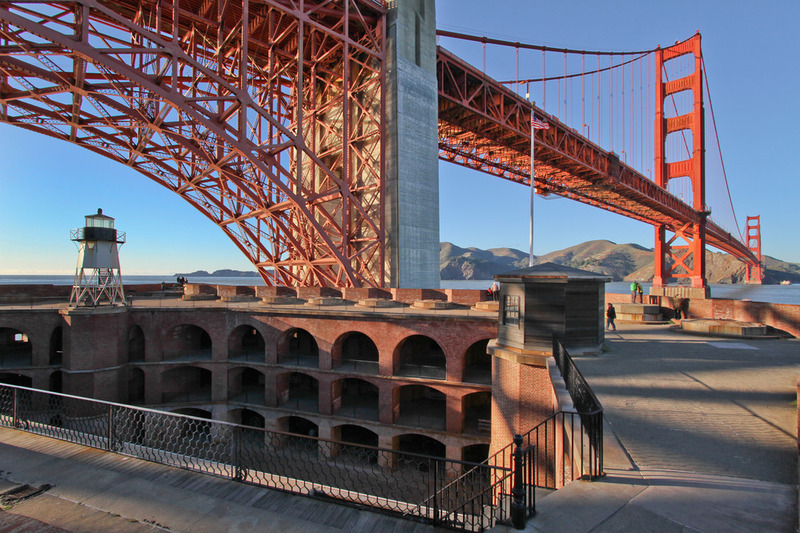 The roof of Fort Point boasts stunning views of the Golden Gate bridge and the coast. We even spotted dolphins playing in the water nearby. Know Before You Go: There is limited free parking at Fort Point but it’s also available by public transportation or bicycle. 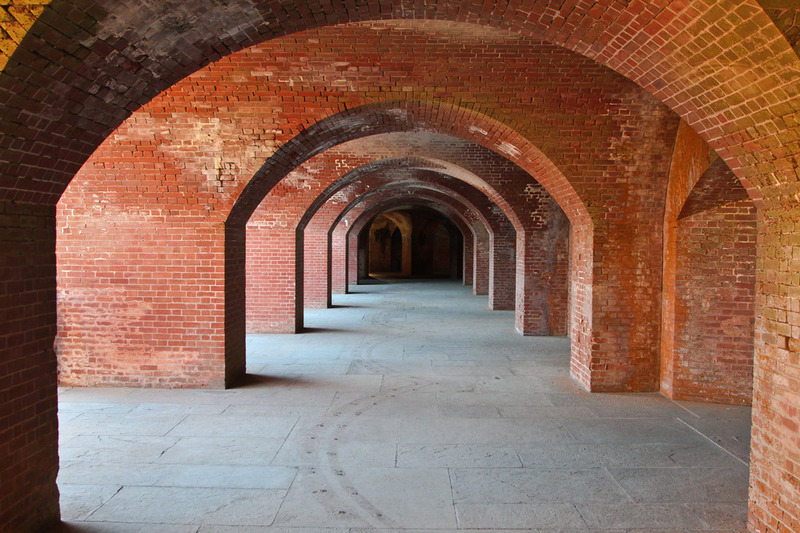 Admission into Fort Point is free. Alcatraz Island is not only one of San Francisco’s top tourist attractions but it’s also a National Park! 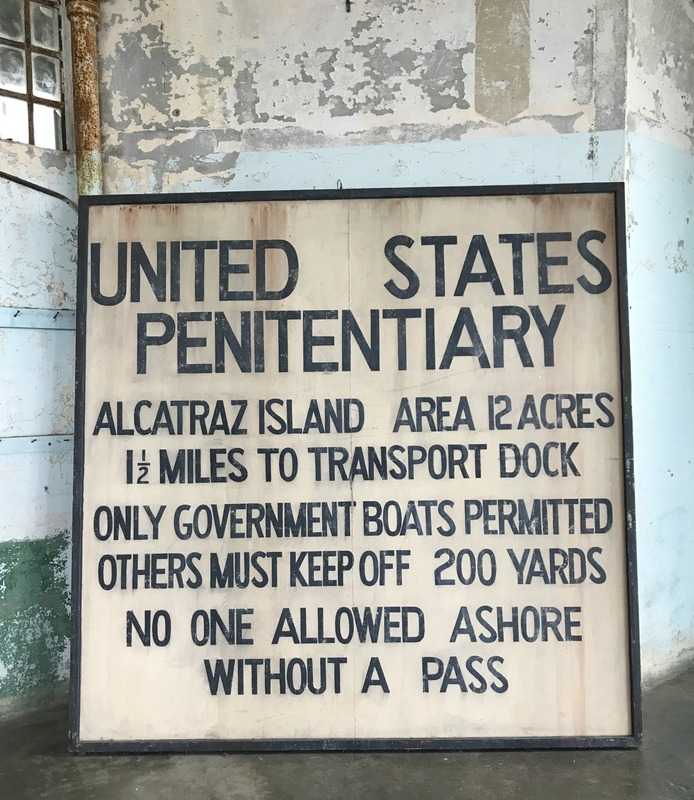 While the other National Parks we visited were a little more off the beaten path, Alcatraz Island threw us right into to the middle of San Francisco’s top tourist destinations. It was much more crowded than any of the other parks we visited, but rife with history and the Junior Ranger Program helped us see things often missed by other visitors. This was my husband’s favorite spot from our vacation. One great thing about touring Alcatraz is that the audio tour is included in your admission. You learn many interesting facts about the island and it’s inhabitants from the program. You can pause it and peruse at your own pace and catch up to it again. The boys found the stories about escape attempts facinating. It was very crowded the day we visited, however I found that the Junior Ranger program had us stopping and observing things that others walked right past. Often we were the only people observing something or exploring an area of the island. So if you’re looking for off-the-beaten path ideas for Alcatraz, grab a Junior Ranger booklet when you get off the ferry. You’ll learn more about some of the trees and birds native to the island as well as some architecture characteristics and more about life of the islands inhabitants – not just the inmates. 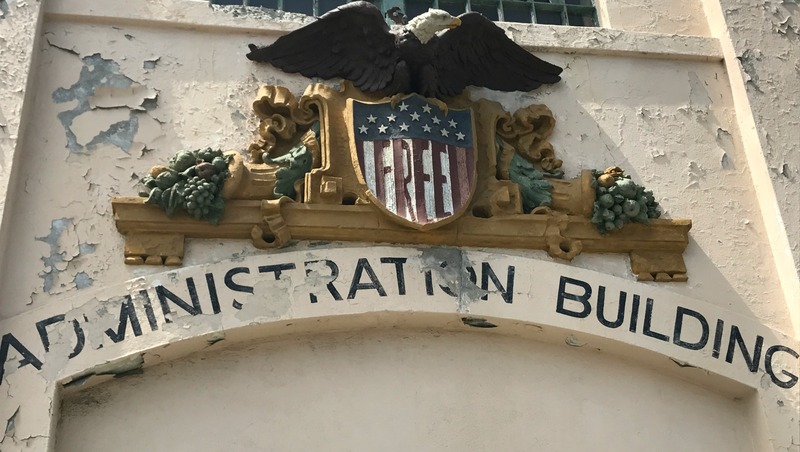 See more pictures and details about our visit to Alcatraz Island: Exploring San Francisco with Kids. Know Before You Go: Advance purchase is highly recommended because of the limited number of visitors allowed on the Island each day. Tickets can be purchased up to 90 days in advance and often sell out. If you are planning to visit during peak tourist times, purchase your tickets well before your trip! Also be advised there is no public parking near the ferry terminal. You will need to take public transportation or walk. Entrance to the park is free, however there is a fee for the ferry tickets. It’s expensive but I thought it was worth the expense. The Presidio was our final stop on our tour of San Francisco’s Urban National Parks and it was fantastic. A former military base, the park has hiking trails, parkland and many historic buildings. 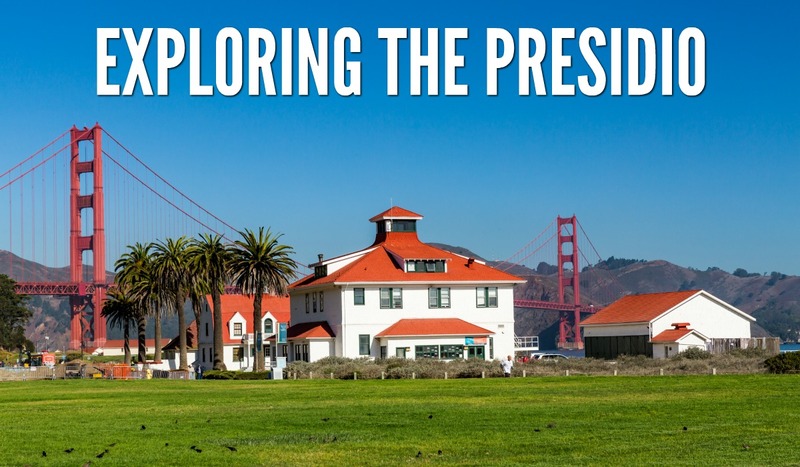 There are so many interesting things to see and do at the Presidio. We really enjoyed all the stunning views and wide open spaces. On a previous trip to San Francisco, my husband and I spent a day at Crissy Field watching the America’s Cup. So this trip we explored the interior of the park. The Presidio’s extensive hiking network features 24 miles of trails and 10 scenic overlooks and vistas. There is one particular hike that takes you to The National Cemetery Overlook. It gives you a stunning view of the cemetery and the bay with the Golden Gate bridge peeking out of the fog. While The Presidio technically doesn’t have a Junior Ranger program, they did unveil a brand new Visitor Center that is amazing. It’s full of interactive exhibits and lots of kid friendly activities like a scavenger hunt. You can also check out adventure backpacks from the visitors center that are incredibly cool for kids. It includes a park map and all kinds of things you’ll need to go on an amazing adventure within the park. 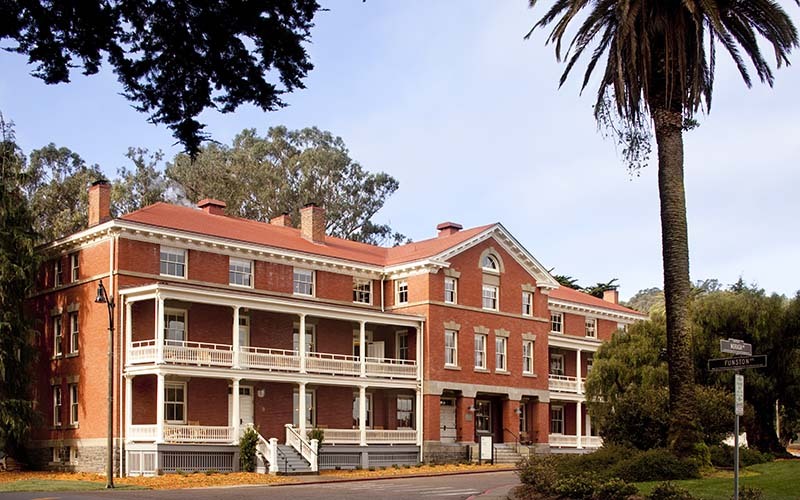 Did you know you can actually spend the night in the Presidio? 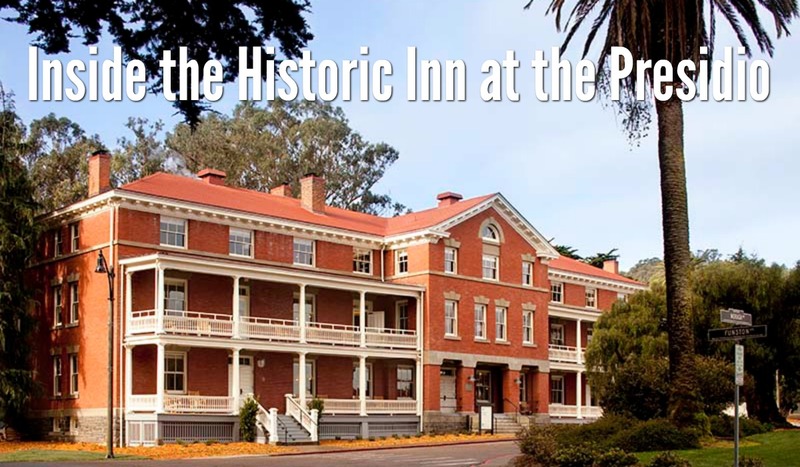 The Inn at the Presidio is located at Pershing Hall. Built in 1903, this historic hall was once home to unmarried officers and is listed on the National Register of Historic Places. The boutique hotel has 22 rooms that are beautifully decorated with features and memorabilia that highlight the hotel’s rich past. We had the luxury of staying here and it was absolutely lovely. The location is calm and quiet with easy access to all the Presidio has to offer. They had one of the best complimentary breakfasts I’ve ever had. There was a front porch with rocking chairs, a fire pit, fire places in all the rooms. It was simply amazing. 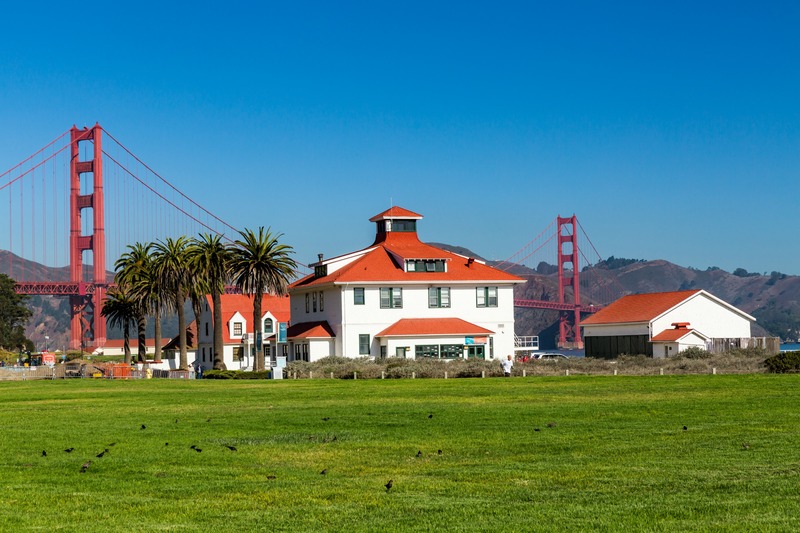 Know Before You Go: It’s so easy to get to/from and around The Presidio. They offer a free PresidiGo shuttle that offers service from the Financial District to the Presidio as well as several routes within the park. The boys and I rode it alone with ease from the Embarcadero all the way back to the Visitor’s Center during rush hour. Visiting San Francisco’s Urban National Parks was probably one of my all-time favorite family vacations. We hiked, explored, learned about San Francisco’s history and saw top tourist destinations, from a different angle. However, the best part for me was that the kids had so much fun doing all the junior ranger programs. Now they are really excited to visit more national parks.